Trevor Elliott poses at a Lewis County Chamber of Commerce Networking Event with Chris Sampson from The Boys & Girls Club, Bruce Hansen from Edward Jones and Cameron McGee from Calypso Window Washing. Photo courtesy: The Lewis County Chamber of Commerce. Chehalis is a great place to work and live, just ask Trevor Elliott, community-based commercial and personal insurance Senior Advisor for HUB Northwest Insurance. Sitting down with Trevor at the Market Street Bakery, it’s easy to see his passion for the community and he will gladly tell you why. “Chehalis has a rich history of giving of time, heart or money and it is a special place because of that,” says Trevor. His passion for his hometown and for giving back to the community who raised him is demonstrated in every aspect of Trevor’s life. From his career to his many projects and volunteer work, Trevor is all about relationships and it shows. 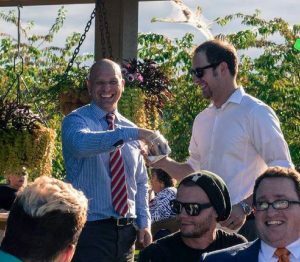 Centralia City Council member Peter Abbarno and Trevor Elliott at a Young Professionals Lewis County networking event. Young Professionals offers professional connections, a way to connect and get involved in the community, and make friends. Photo credit: Josh Tibbits. Trevor, who played sports as a young person, is now able to live out some of his childhood dreams. After studying business in college, he returned home and is now an assistant coach for W.F. West’s boys basketball team. He feels being part of his alma mater is a blessing, a way to reach youth before they graduate and a way to help them build character. Trevor Elliott spoke at an Economic Development Council meeting. The EDC’s goal is to contribute to the economic vitality of the community by increasing the number of jobs and improving the local quality of life. Photo courtesy: Trevor Elliott. A true servant leader, Trevor strives to show grace to others. His involvement in the community is far-reaching and diverse. 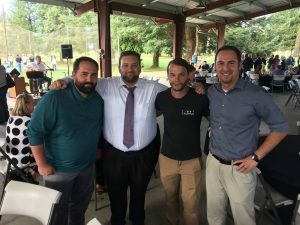 Aside from coaching and Young Professionals, Trevor is also Chair of the Economic Restructuring Committee with the Chehalis Community Renaissance Team. He is a mentor at W.F. West High School and is now President of the Visiting Nurses Foundation. Jenny Collins, Executive Director of the Visiting Nurses Foundation and Assured Home Health and Hospice, says of Trevor, “He is a selfless giver of his time and expertise. I rely on him for professional advice to help people in the worst time of their lives.” The Visiting Nurses Foundation is in nine counties, including Lewis County. They offer a medical equipment bank as well as home hospice care for people in need of end of life care. Trevor Elliott speaking at Centralia College’s Washington Business Week. 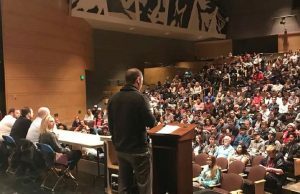 This program allows local high school students to get a real life business experience from leaders in the community. Photo credit: Trevor Elliott. Part of Trevor’s work with the Economic Vitality Committee has been with the Washington State Main Street Program. 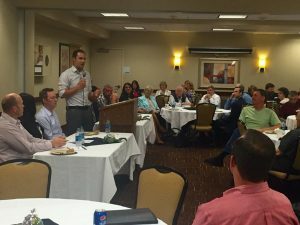 This program is helping communities like Chehalis and Centralia to rejuvenate their economy and the image of their business districts. By offering tours of vacant buildings to potential business owners in Chehalis, the committee has helped to occupy eight spaces that were empty in the downtown area. Another project near and dear to Trevor is the Downtown Facade Grant Program. This project is also offered by the Chehalis Community Renaissance Team. The grants are designed to help downtown businesses and property owners improve the fronts of their buildings. The grants offer a fifty percent match, up to $2,500 per business for enhancement expenses. Trevor and the W.F. 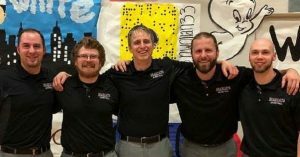 West coaching staff after a win vs Centralia earlier in the season. Trevor says, “Sports reveal character.” One of his favorite sayings is, “Adversity causes some men to break and others to break records.” The W.F. Boys basketball team currently holds a 10-0 record. Photo courtesy: Trevor Elliott. After our interview, Trevor was eager to show me a newer business on Market Street downtown. Chehalis Coworks offers an ideal place for freelancers, travelers and mobile professionals to get work done in a shared and collaborative workspace. The newly remodeled space has fast Wi-Fi, meeting spaces, quiet areas and outdoor space, as well as a kitchen and office supplies. Accessible twenty-four hours a day, seven days a week, space can be rented by the day, week or month.